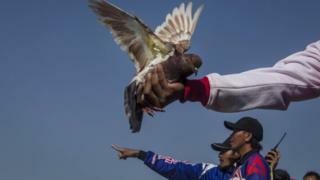 An increase in divorce petitions in one part of Indonesia is being blamed on the love of pigeon racing, it's been reported. An official at the Purbalingga Religious Court in the country's Central Java province says that their office received 90 petitions for divorce in July, a huge increase on June's figure of just 13, the Jakarta Post reports. According to clerk of the court Nur Aflah, "Most of the petitioners are wives who have filed divorce petitions for economic reasons because their husbands are too addicted to pigeon racing." Pigeon racing is hugely popular in Indonesia, where competitors are drawn by cash prizes and the hope of selling a particularly fast bird for thousands of rupiah. Ms Aflah says that the women are annoyed that their husbands spend all day with their pigeons instead of with their families. Financial concerns makes things worse: "In Purbalingga, there are many female workers while most men are unemployed. Most of the husbands end up becoming 'pilots'. Here, a 'pilot' does not fly a plane but races pigeons," she explained. Gambling on pigeon races only leads to further financial distress, the Jakarta Post reports. One villager told the paper that while her husband sometimes gives her money from his winnings, more often he asks her for money for cigarettes. It's the reverse situation in parts of India, where pigeon racing seems to be in a terminal decline, The Hindu newspaper reported recently. Locals in south-eastern Andhra Pradesh say the generations-old tradition is falling foul of modern forms of entertainment, with pigeon fanciers finding it difficult to find opponents to race against. Their version of racing birds is rather different from others, with the last pigeon to return to the coop being declared the winner, not the first. The long waits and the expense could be putting off potential owners. Pigeon racers can spend up to 5,000 rupees ($78; £57) on food and grooming for their birds prior to a race, The Hindu reports. "The sport has lost its sheen over the years. I had to give it up as I find no enthusiastic pigeon-keepers," one former racer told the paper. Courts in Damascus will try reduce divorce rates by playing couples a film about separation.